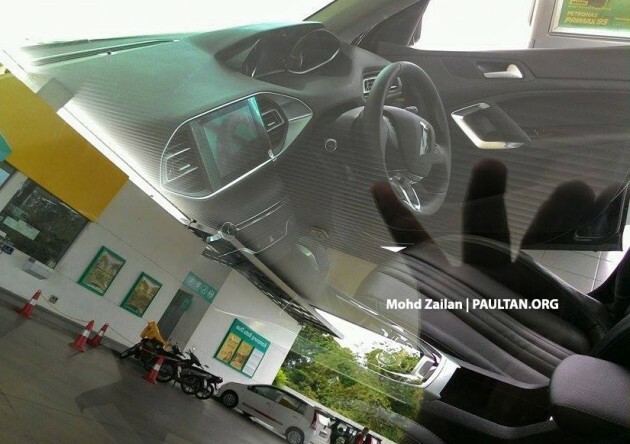 Sightings of the 2016 Peugeot 408 have gathered steam – these come courtesy of reader SyauQi Beverly, and show clearer details of this colourful dotted camouflaged prototype than the sole image seen previously. Again, there’s nothing much new to see here about the upcoming Gallic C-segment sedan – the LED headlights and blade-design five-spoke wheels that this mule wears (again sporting Kedah trade plates, indicative of Naza’s Gurun manufacturing facility) have all been seen before. However, the recently-previewed lower-spec variant of its hatchback twin, the 308 THP Active, does provide a few clues to our 408’s origins – the aforementioned wheels are identical to the 17-inch “Rubis” alloy wheels fitted to the Active (the higher-end 308, introduced earlier this year, rides on 18-inch “Saphir” items”). These, plus the 308-style i-cockpit dashboard seen previously (high-set instrument cluster, smaller steering wheel) are not offered in China, the only other market to have received the new 408 so far. This suggests that Naza is developing a right-hand drive version solely for our market using parts from the 308 it has lying around, which explains the car’s rather protracted journey to showrooms. It was revealed to us back in March that the new 408 could launch sometime in the second half this year, but seeing as we’re only a few days until the end of the year, it’s a safe bet it will arrive in 2016 instead. Under the bonnet should sit a direct-injected, turbocharged 1.6 litre THP engine with a six-speed automatic – China also gets 1.2 litre e-THP and normally aspirated 1.8 litre CVVT mills. Just another European Proton. Buy it on your own lucks. Good or not, sales figure tell the truth. Vios with banyak masuk workshop engine can sell? U wrong, Vios only enter once to workshop. What you think climatizing a car takes a day or two? Coming civic 2017 oso powderful what? 408 or Focus, I dunno choose which one? Glenmarie salesman said it’ll be only on sale in late Q2 or Q3. Rear looks exactly like Nissan Selphy. Front beautiful, dashboard and steering wheel look terrific. The problem with the stock turbo in peugeot cars is lack of (1) turbo timer (2) dedicated auto gearbox oil cooler. If the cars come with these, there will be far less problem.